Teams begin the 8th Leg by flying back to Athens on any one of four flights arriving between 7:30am and 1:45pm. 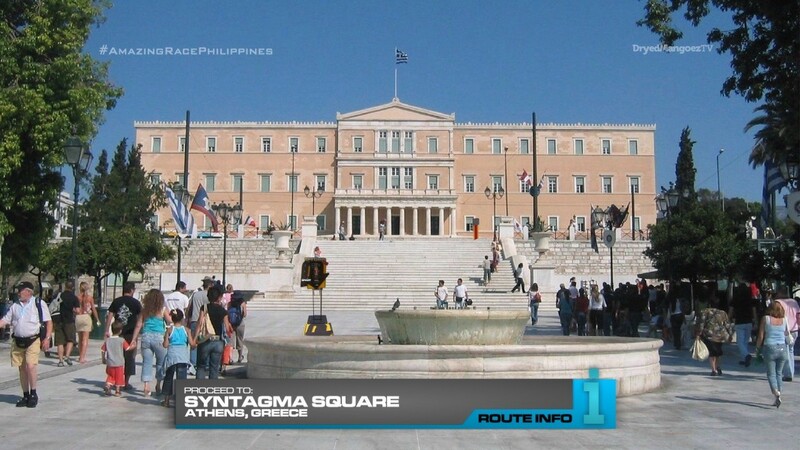 Once in Athens, they must make their way to Syntagma Square. 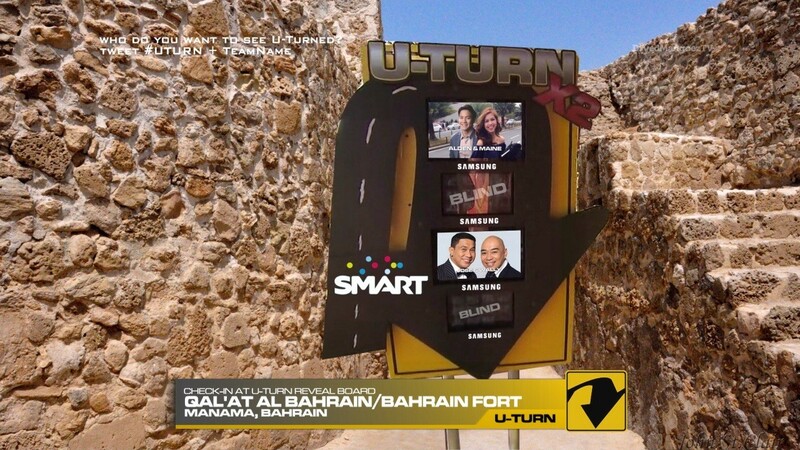 Here, they will find a Forced Double U-Turn Vote Board sponsored by Samsung and Smart. 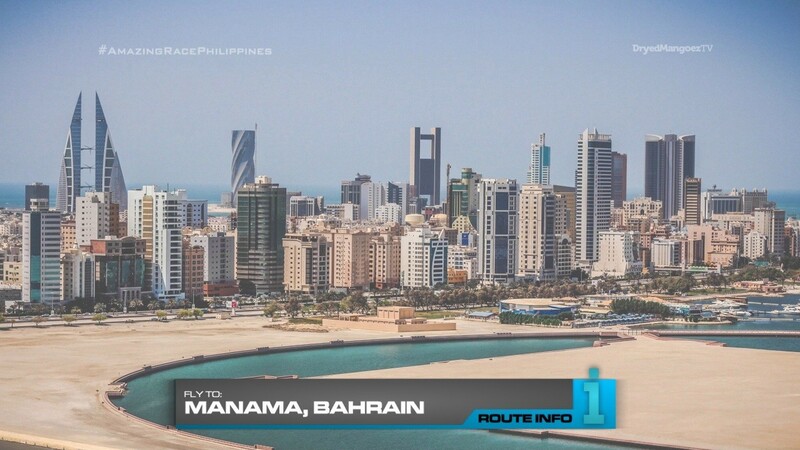 After voting for the two teams they want to see U-Turned, they will open their next clue to find they will now be flying to Manama, Bahrain! Teams will all be flying on the same Qatar Airways flight via Doha arriving in Manama at 9:20am. 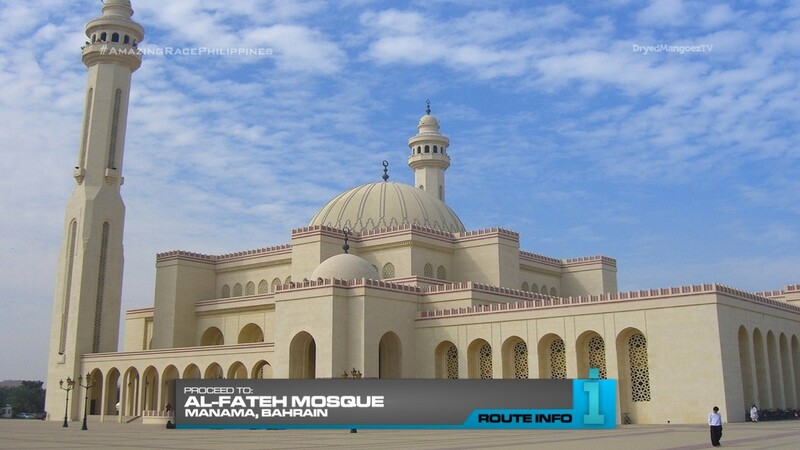 Once in Manama, teams must make their way to the Al-Fateh Mosque. After dressing in appropriate attire, they will enter mosque to receive their next clue. 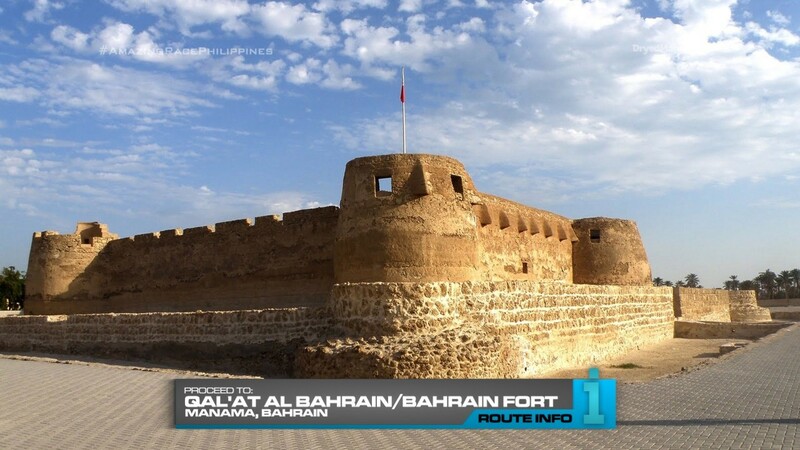 That clue directs teams to Bahrain Fort. 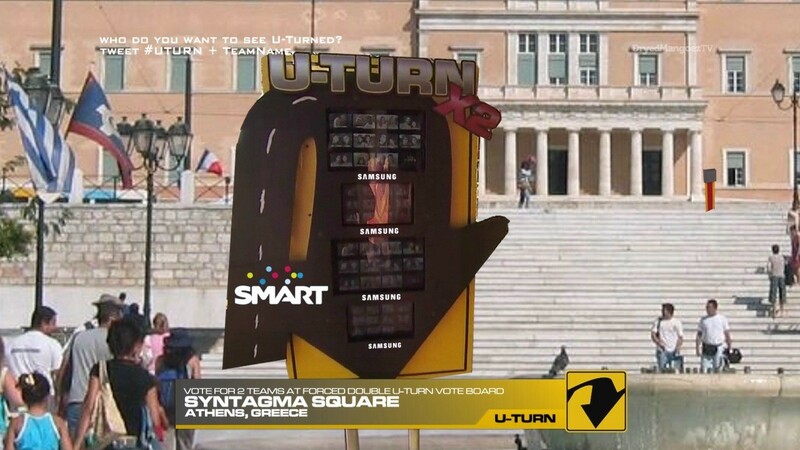 And here, teams will find the Double U-Turn Reveal Board sponsored by Samsung and Smart. They will be shocked to see it is a BLIND! Forced Double U-Turn. 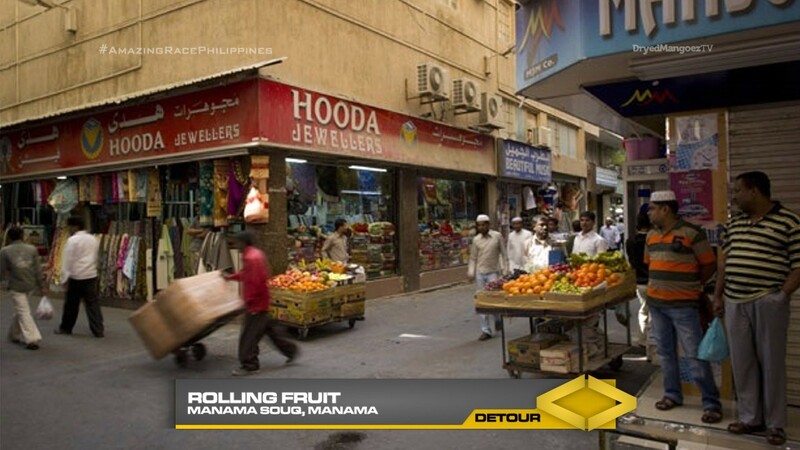 In Rolling Fruit, teams will head to Manama Souq and load a rolling cart with fruit that must be delivered to two different stalls within the souq. Once they delivered the exact number of fruit to the stalls, they will receive their next clue. 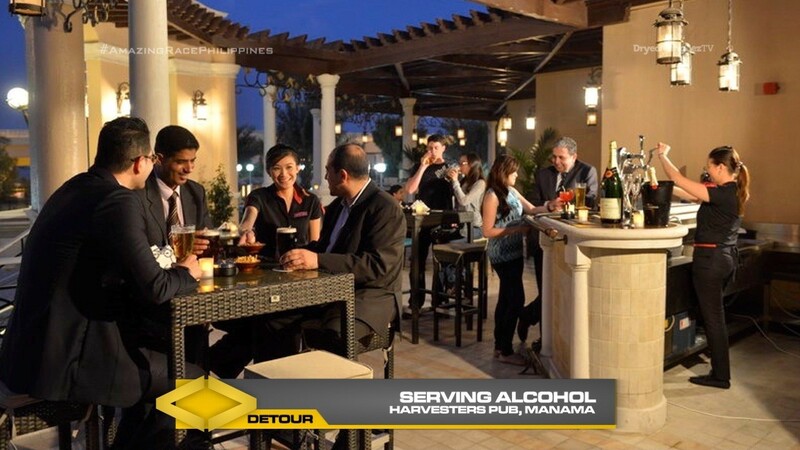 Bahrain is one of the few countries in the Middle East where alcohol is legal. In Serving Alcohol, teams will head to Harvester’s Pub where they must take the alcoholic drink orders of a table of ten customers and correctly serve them to receive their next clue. After the Detour, teams will discover the Road Block: Who wants to go searching for pearly whites? Pearl diving has historically been a major industry of trade in Bahrain and neighboring Qatar. For this Road Block, teams will dive into the water and collect enough clams to fill a marked bucket. Once they have enough clams, they must then find one containing a pearl to receive their next clue. 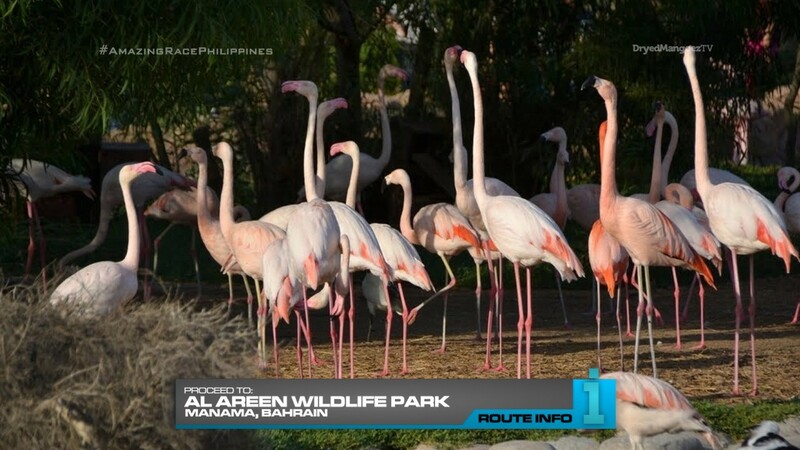 That clue tells teams to head to the Al Areen Wildlife Park. Here, teams must search a sea of fake flamingos for two that match. 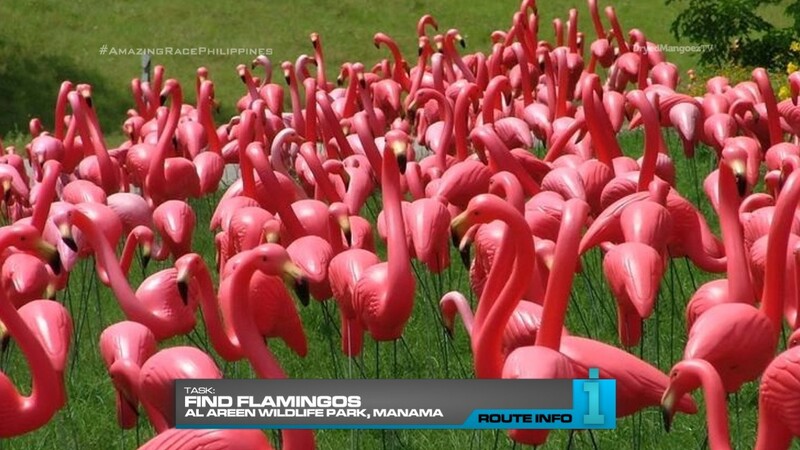 Once they have confirmed they have the correct flamingos, they must make their way on foot to the Bahrain International Circuit. 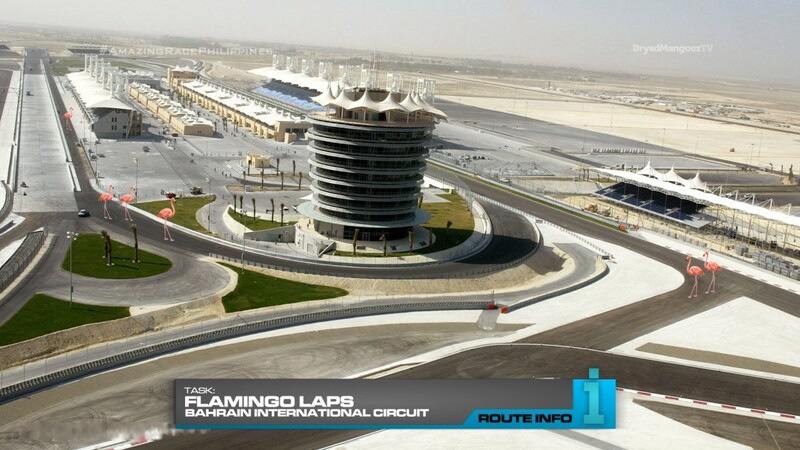 And here, teams must roll their flamingos around the racetrack two laps before they can check-in at the Pit Stop. And that Pit Stop is located somewhere near the track. The first team to arrive here will win P200,000 courtesy of our friends at Shell V-Power Nitro+. But they mustn’t dwell too much on their penalty because the next Leg starts RIGHT NOW!!!!! Another Non-Elimination Leg with a zero hour Pit Stop. TARPHDME has always made sure to distinguish Non-Elimination Legs, which carry penalties, from SuperLegs which contain two full Legs worth of tasks. First though, Bahrain is a country not yet visited by TAR. So TARPHDME beat them to it! Yay! 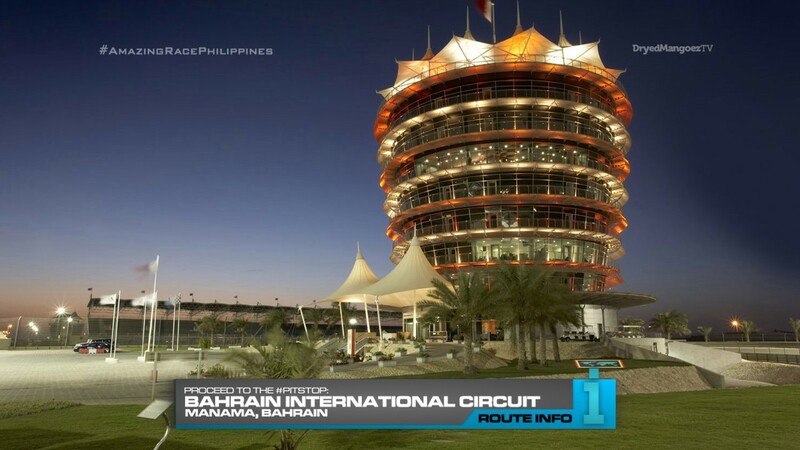 There are of course many Filipinos living and working in Bahrain, so having a Leg here shouldn’t be a problem. The mosque clue should play out like TAR23’s mosque Route Marker. And this would be the first time TARPHDME revealed the U-Turned teams before even learning what the Detour is. Should be interesting. The Detour gets teams into a souq which can always get crazy. And the alcohol highlights one of the interesting things that make Bahrain unique. The pearl Road Block is interesting because I am not really sure how big pearl diving really is in Bahrain. But oh well. I’ve never been there, so I wouldn’t know! lol The real TARPH team would definitely scout it in advance though. The flamingos and racing them around the track is just a quirky task that puts teams, hopefully, under the blazing sun to just tire them out before surprising them with a zero hour Pit Stop. Teams must be pushed to the limit!